Over the millennia, ancient games of chess spread throughout the world and evolved differently in various cultures. The Chinese version is popularly known in the West as "Chinese chess". The Chinese call it xiangqi (象棋) which translates as "image chess" or "elephant chess". 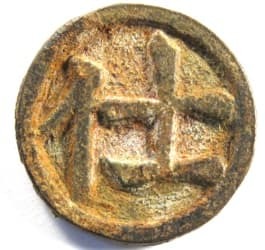 Xiangqi or Chinese chess was played in ancient times with metal, and sometimes porcelain, coin-shaped pieces which were traditionally collected and researched by those interested in old Chinese coins, charms and horse coins. Nowadays, the game is usually played with wood or plastic pieces. While "image" or "elephant" may seem like strange names for a chess game, the Chinese character xiang (象) actually means elephant or image. Perhaps even more noteworthy, and unlike Western chess, the game pieces really include elephants. Besides elephants (xiang 象), Chinese chess also includes generals (jiang 将) , soldiers (zu 卒), horses (ma 马), chariots (ju or che 車) , guards (advisors, counselors) (shi 士), canons (pao 炮), palaces (gong 宫) and even a river (he 河). 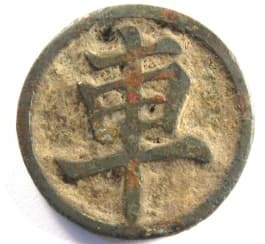 The earliest Chinese xiangqi pieces discovered so far date from the Song (960 - 1279 AD) and Yuan (1271 - 1368 AD) dynasties. The earliest xiangqi chess board discovered dates from the Ming Dynasty (1368 - 1644 AD). There are 32 xiangqi pieces in a set and complete sets of Song Dynasty xiangqi pieces are very rare. The National Museum of Chinese History in Beijing is known to have four complete sets of Northern Song (960 - 1127 AD) xiangqi pieces. The Shanxi Museum of History has one complete set of Northern Song pieces. There are no complete sets of these early Song Dynasty xiangqi pieces known to exist in private hands. This is the character side of an old Chinese xiangqi chess piece from my collection. 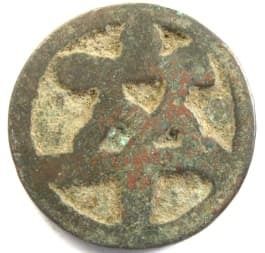 The character is zu (卒) which means soldier. The piece moves on the chess board in a similar, but not identical, fashion as the pawn in international chess. Just as Western chess is played with "black" and "white" pieces, Chinese chess is played with "red" and "black" pieces. 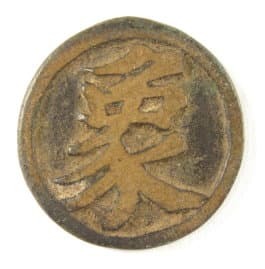 Even though the metal of this piece has a reddish hue, the character zu indicates that it would have been a member of the black pieces. Red pieces would have had the character bing (兵) instead. Bing also means soldier. 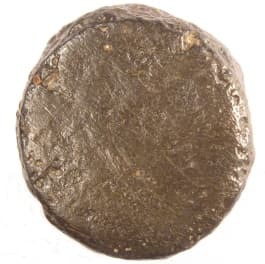 The piece has a diameter of 22 mm, a thickness of 3 mm, and a weight of 9.8 grams. This is the other side of the chess piece. As you can see, it shows a soldier holding a weapon. 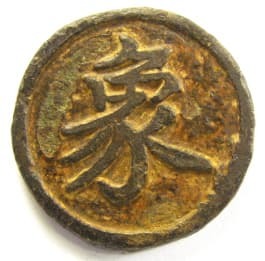 This piece displays a good bit of wear indicating that it must have seen use in countless xiangqi chess games over perhaps several centuries. This Chinese chess piece is displayed on the dust jacket of the critically-acclaimed novel "Ministers of Fire" by Mark Harril Saunders. Displayed here are the two sides of another ancient "soldier" xiangqi piece. 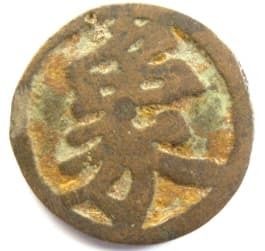 This piece has the "soldier" (zu 卒) character on both sides. The diameter is 29.5 mm, the thickness is 2.2 mm, and the weight is 10.2 grams. 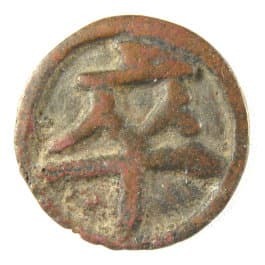 As mentioned above, the corresponding "red" piece to the "black" zu (卒) piece is the bing (兵) which also means "soldier". At the left is a very interesting example of an old Chinese chess bing (兵) piece. 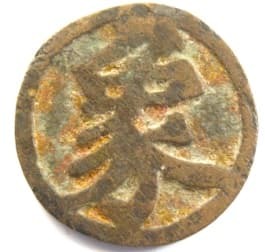 This piece was reportedly found near the Sumatra River in Indonesia and probably dates to the 1750-1800 period of the Qing (Ch'ing) Dynasty (1644-1911). 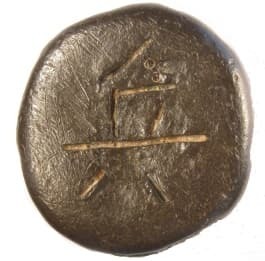 This is the reverse side which has no symbols or characters. This piece appears to be made of tin, although I am not certain of the metal, and is very large and heavy. The diameter is 35-38 mm and the thickness is 12 mm. The piece weighs a hefty 125 grams! 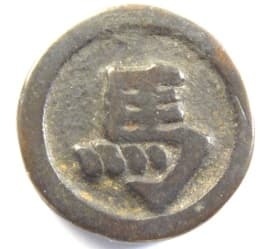 The Chinese character on this old xiangqi piece is ma (马) meaning "horse". The horse moves in a similar pattern as the knight in international or Western chess which is one point vertically or horizontally and then one point diagonally from its original position. Unlike the knight in Western chess, however, the horse cannot jump over another piece. 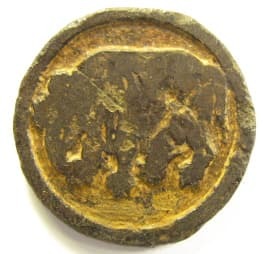 The other side of this xiangqi piece has an image of a horse. This particular piece is most unusual in that it shows the horse with a saddle. 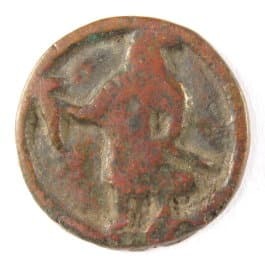 Very few xiangqi pieces or horse coins display the horse and saddle. 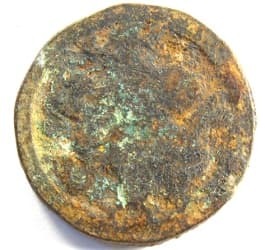 This piece has a diameter of 24 mm, a thickness of 2.2 mm, and a weight of 5.5 grams. This is another ancient xiangqi horse piece. The horse character ma (马) is written in a slightly different calligraphy. Also, the piece has a broader rim. The other side of this xiangqi piece displays a horse in full gallop. The diameter is 23.5 mm, the thickness is 3 mm, and it is fairly heavy at 9.1 grams. The ancient xiangqi piece at the left displays the Chinese character ju (車) meaning chariot. The modern pronunciation of this character is che. The chariot moves in exactly the same manner as the "rook" in Western chess. 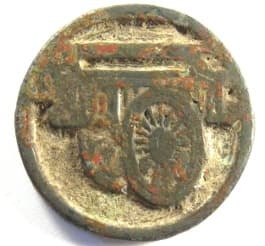 The reverse side of this piece displays a detailed image of an ancient Chinese chariot. This chariot xiangqi piece has a diameter of 25 mm, a thickness of 2.2 mm, and a weight of 6.4 grams. The xiangqi piece at the left has the Chinese character shi (仕) which can translate as an official or government servant. In English, this piece is variously referred to as a guard, advisor, counselor, minister or warrior. 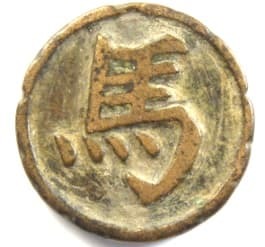 This particular piece with "guard" written as "仕" (shi) indicates that it is a red piece. The corresponding black piece would be written as "士" (shi). A game of xiangqi begins with one "guard" to the right and one to the left of the "general" in the "palace". The guard can only move one point diagonally and must remain inside the palace. The purpose of the guard is to protect the general. At the far left is the reverse side of this xiangqi piece displaying the image of a guard or counselor. The advisor is wearing very elaborate clothing. 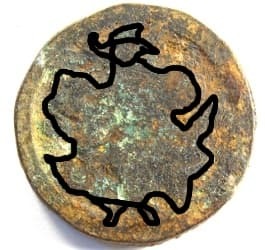 Since the patina makes the picture difficult to see, I have drawn a very crude outline of the guard on the near image. 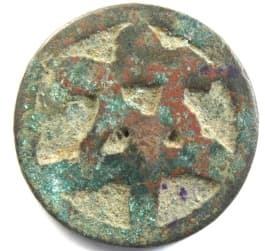 This piece has a diameter of 26 mm, a thickness of 2.2 mm and a weight of 7.2 grams. Xiangqi or Chinese chess can be translated as "elephant game". At the left is a very nice specimen of an old xiangqi elephant piece with the Chinese character xiang (象) meaning "elephant". 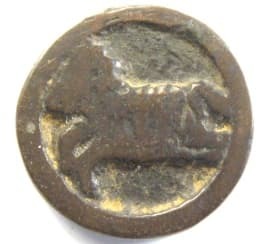 The reverse side displays an image of an elephant. This elephant chess piece has a diameter of 25 mm, a thickness of 2 mm and a weight of 5.7 grams. 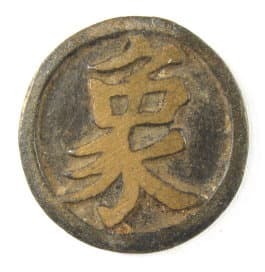 This is the obverse side of another old Chinese xiangqi chess piece. The Chinese character is xiang (象) which means elephant. The elephant moves two points diagonally and cannot cross the river. This piece would have also been one of the black pieces. The corresponding red piece would have had the character 相, also pronounced xiang, but meaning a government minister. This is the other side of the piece. As you can see, it has the same elephant character. This elephant chess piece has a diameter of 32.5 mm, a thickness of 2.5 mm, and a weight of 11.9 grams. Here are the obverse and reverse sides of another ancient xiangqi elephant piece. Close observation shows that there are slight differences in the calligraphy of the elephant character (xiang 象) compared with the piece shown above. 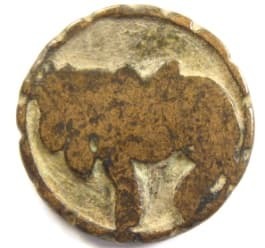 This elephant piece has a diameter of 25.5 mm, a thickness of 1.5 mm and a weight of 5.8 grams.